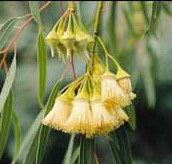 At least 53 plant species are endemic to the Shark Bay region and their restricted range means that some are quite rare. Two are on the national threatened species list, the endangered dragon orchid (Caladenia barbarella) and Beard’s mallee (Eucalyptus beardiana). Priority 1, 2 and 3 species – ranked in order of urgency for study and evaluation of their conservation status. There are 10 Priority 1, 20 Priority 2 and 20 Priority 3 species in the Shark Bay World Heritage Area. These include the endemic Acacia drepanophylla, Grevillea rogersoniana, Macarthuria intricata, Physopsis chrysophylla and Verticordia cooloomia. Some of these priority species occur in Shark Bay’s unique tree heath. Priority 4 species – adequately known and rare but not threatened. They require monitoring every 5–10 years to check their status. There are six Priority 4 species in Shark Bay, including Jacksonia dendrospinosa. Priority 5 species are not threatened but depend on specific conservation programs. If these programs were to end, the species would become threatened within five years. No species in Shark Bay has Priority 5 listing.